Did you know you can order M&Ms online? By ordering bags of personalized M&M’s for gifts or parties, you can share your own sentiment or special occasion with others! Psst… I think wedding M&Ms and M&Ms personalized with your business logo are some of the most popular. #1. Choose your colors — up to 2 different colors per order if you’re just personalizing with words; or 3 different colors if you’re personalizing with images & words or logos. HINT: You can personalize 20 of their 25 different colored M&Ms. The other 5 colors — black, dark blue, teal, maroon and brown — can be mixed in with your order, but not personalized. #2. Compose your message — up to 2 lines, using a maximum of 9 characters per line (including spaces). #3. Indicate your quantity — a 7 oz. bag is $11.99 with a 3 bag minimum. 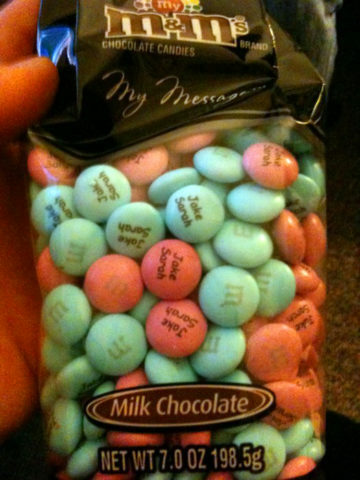 Personalized M&M’s are also available in smaller favor bags and in larger bulk size packages. HINT: 1.5 oz of M&Ms equals approximately 50 M&Ms. 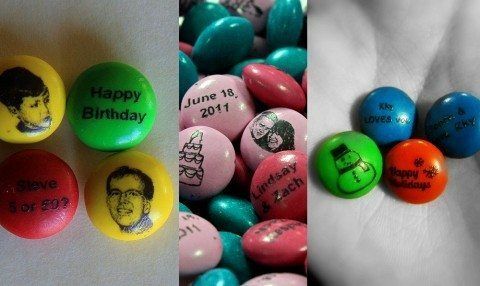 Order personalized M&Ms for own special occasion. Get the promo code for one free bag of M&Ms (to be used when you place an order). Questions about ordering personalized M&Ms? Check out the official personalized M&Ms FAQ. …like these candy tins that make great wedding favors! …like these chocolate biscotti personalized favors! …like these love notes icing cookies! …like these chocolate-covered almonds available in fun colors or white chocolate!